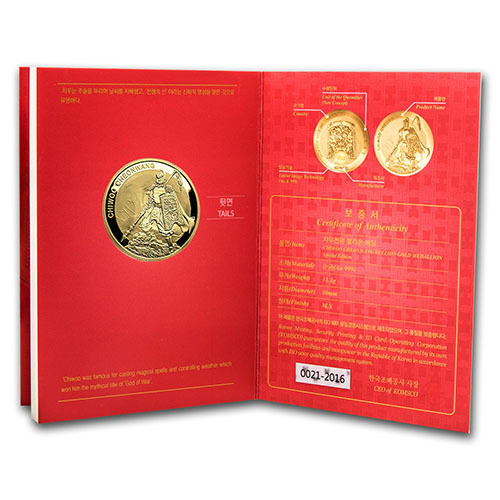 Among the most popular products with those buying gold right now is the Chiwoo Cheonwang Series. Introduced in 2016 by KOMSCO, the official mint of South Korea, the Chiwoo Cheonwang Series features progressive designs that change with each year but are connected to one another in concept. 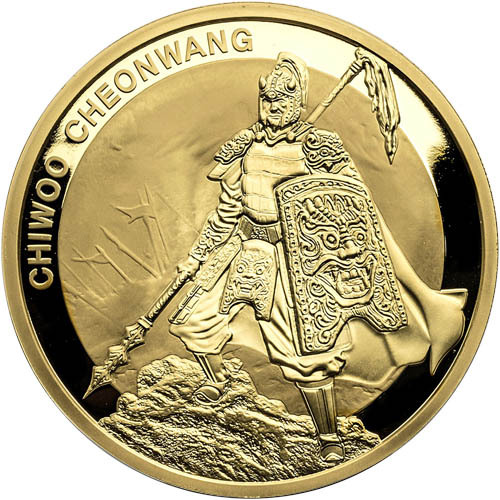 Today, you’ll find the 2016 1 oz Gold South Korean Chiwoo Cheonwang available to you online at Silver.com. Available to ship to you with a protective card and Certificate of Authenticity! First-ever issue of the Chiwoo Cheonwang medals in gold! Mintage limited to 2,016 medals only! Consists of One Troy ounce of .999 fine gold. The obverse of each medal has Chiwoo’s shield. On the reverse is Chiwoo Cheonwang as he prepares for war. 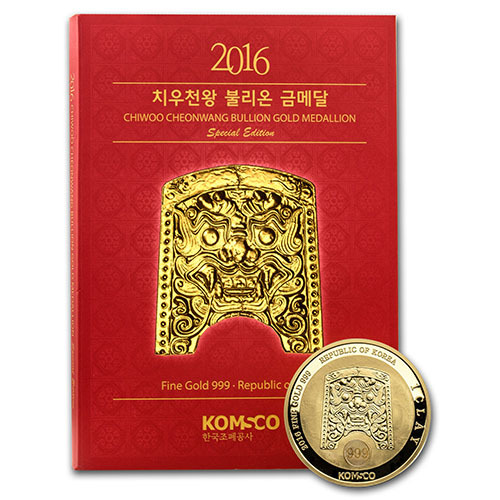 The first major gold bullion series from KOMSCO is the South Korean Chiwoo Cheonwang. The medals were offered in that first year in 1 oz silver, 1 oz gold, and 1/10 oz gold medal options. The silver medals had a higher mintage, but the gold medals had low mintage figures that resulted in scarcity. These initial 2016 Gold Chiwoo Cheonwang Medals were struck with just 2,016 in total. 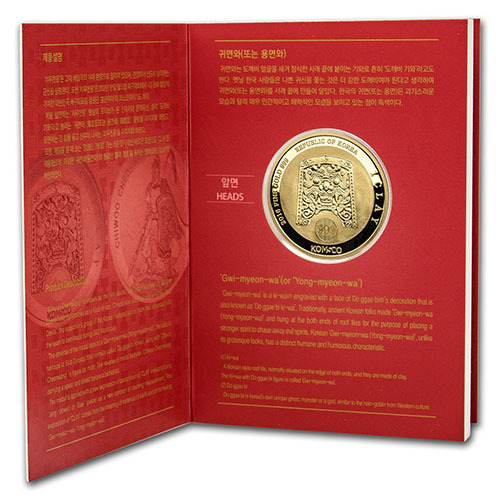 When you purchase one of the 2016 1 oz Gold South Korean Chiwoo Cheonwang Medals in this listing, you receive a gold bullion product in Brilliant Uncirculated condition. Each one of the medals is housed within a protective packaging card that includes the Certificate of Authenticity information. 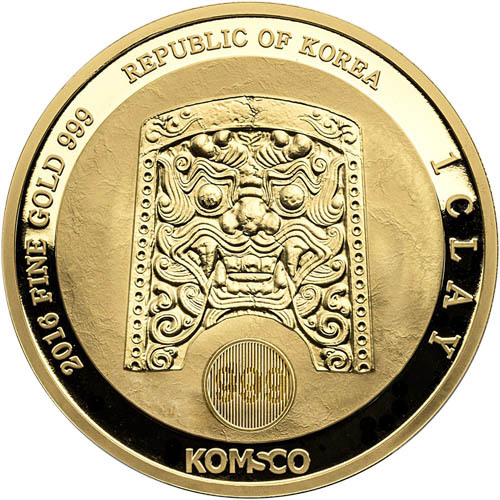 On the reverse side of each 2016 Gold South Korean Chiwoo Cheonwang is the first design in the series. In this image, Chiwoo is depicted standing on the field of battle as he prepares his forces to launch into battle. It is said that Chiwoo’s armies went undefeated in battle over the course of 10 years and that he possessed the power to summon fog and change the weather on the battlefield to benefit his forces. Chiwoo Cheonwang medals from KOMSCO have a new reverse design each year. The series progressively follows Chiwoo’s character as he prepares for battle (2016), mounts his horse to ready himself to ride into battle (2017), and even a design of him in the thick of the fighting (2018). The obverse face of 2016 1 oz Gold South Korean Chiwoo Cheonwang Medals includes the image of Do ggae bi. This grotesque figure is said to have the ability to ward off evil spirits and was commonly used on the shield of Chiwoo Cheonwang as depicted here in this design. Silver.com would like to encourage any customers with questions to call us at 888-989-7223. You can also connect with us online through our live chat service and email address options.